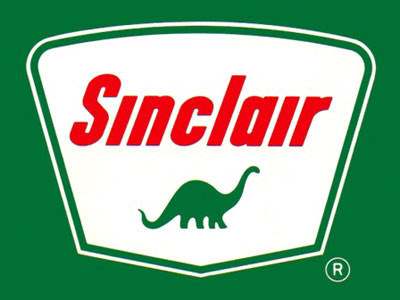 How much do we all want to bet that Sinclair Oil was the inspiration for the surname of the central family on the very self-aware sitcom Dinosaurs, whose patriarch is referenced in the title of this post. I'd like to think that this was the case, especially because all of the Dinosaurs characters died in the shows finale, thus making them all prime candidates to be petroleum products today. Also, since the subject has already been brought up, did you all realize that Jessica Walter of Arrested Development fame and soon to be of neo-90210 ignominy was the voice of the matriarch on Dinosaurs? Just try to imagine what Lucille Bluth would sound like angrily saying "Earl Sneed Sinclair" and you'll get it. Very intentional. I remember my parents pointing this out at the time. Similarly, Earl's boss is BP (British Petroleum) Richfield, and his best friend is Roy Hess (Hess being an American oil company that recently gave a ton of money to John McCain). In the 17 years since the show debuted, I've always associated these characters with these brands, although BP's takeover and rebranding of Amoco has eroded Mr. Richfield's market share in my brain. Looking at the Dinosaurs wikipedia article, I see that there's even more examples in the show that I wasn't aware of. My father worked for Sinclair Oil when I was growing up. It still exists in the western half of the US (in much smaller size). The company has a website that even sells merchandise with the dinosaur logo!